The Full Pink Moon is nearly here. It’s the first full moon after the Equinox: a time to harness the rebirth and renewal of the changing season and to connect with the potential of the Cosmic Womb and your feminine inner knowing. You know you want to meditate with me for that! Miranda Gray says that when we connect with the moonlight of this April moon, we connect with “the deepest and strongest feminine energy of inner knowing.” And we tap into the Cosmic Womb that is gestating all that we desire. This is a safe space for us to let go and to allow the hidden seeds of transformation to take root and grow. If you’re in the Northern Hemisphere like I am, you’re seeing Spring seeds sprouting (finally!) all around you. This is the work of Ostara, maiden goddess of fertility and new beginnings, whose responsibility it is to banish winter by bringing spring to the earth each year. In fact, the juiciest of female hormones, estrogen, is rumoured to be named after her. She embodies fertility, potential, and new life. Her arrival invites us to nurture the seeds we’ve planted in all areas of our lives, preparing for the promise of growth and opportunity after the hibernation of winter. Those seeds are already in the belly of the earth, the Cosmic Womb where what you can’t yet see is waiting to emerge. They’re embedded just below the surface. Now is the opportunity to allow the potential that’s been gestating to push through the surface and manifest. I’ll guide you through Miranda Gray’s Full Moon Ray Meditation especially for the Pink Moon. We’ll share what came up for us during the meditation, supporting and virtually holding our sisters. You’ll want to be somewhere comfortable and quiet so you can get the full benefit of the meditation. 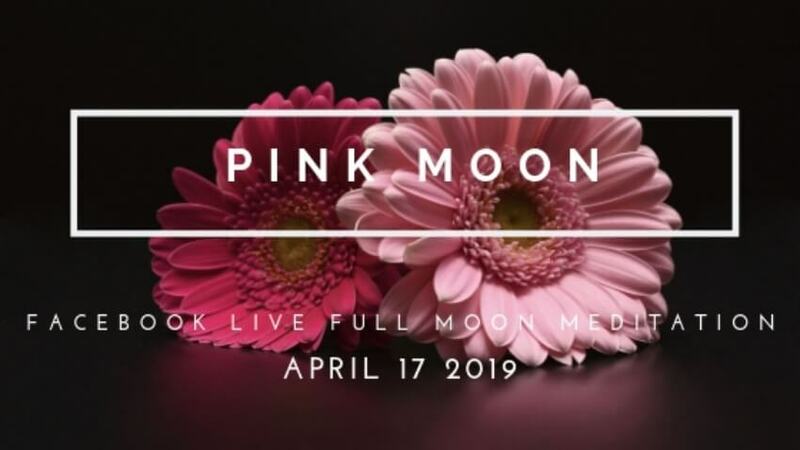 Our meditation under the Full Pink Moon is happening on Wednesday, April 17 at 5:45 pm EST / 2:45 pm PST / 10:45 pm UK / 7:45 am on Thur, Apr 18 in Sydney, Australia. ==>> RSVP TO MEDITATE WITH ME APRIL 17!